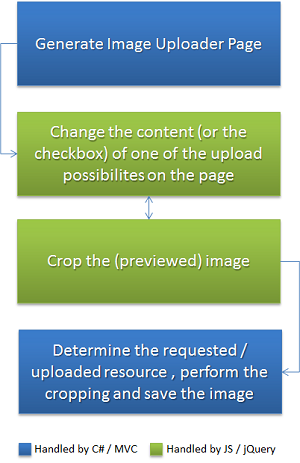 Uploading an image to a website is a task that is required in nearly every website. The requirement could exist due to a CMS background or due to user generated content like profiles, posts, and various other usages. A common problem is the lack of image editing options. We do not want to build a very rich editor in this article, however, we want to build an image uploader that can handle more than just plain file uploads. Additionally our image uploader should be able to perform an easy crop job. We will build everything with ASP.NET MVC 3 on the server-side. The client side will heavily use jQuery and a plugin called ImageAreaSelect. The plug-in will enable us to do (instant) cropping from the client's web browser. In order to preview images from the local file system we will use the FileAPI, which is available in all current browsers. The basic idea of this whole process is displayed below. Ready? 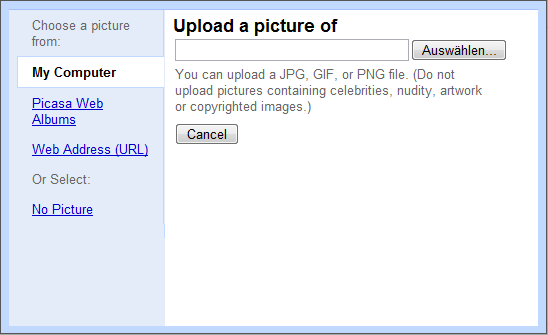 So let's actually build this fancy Google style image uploader! We start with the "Internet Application" template from the ASP.NET MVC 3 package. For simplification, we just remove everything that has something to do with a database or user accounts. In general a webpage will have something like this - but for this mission, those two things are not required. So we named the model UploadImageModel. This is not a required convention like the *Controller convention for any controller. This is, however, very useful in order to distinguish between controller-view exchange models and all other classes. else // model.IsFile should be checked ! Now this looks pretty complicated in the beginning. What does the action do exactly? First of all the model is checked for validity. This is a rather simple check just involving the data annotations we've set up in our model. After the simple values have been checked, we can focus on more complicated stuff. We just look at each possibility (URL, Flickr, and upload from the local file system) and execute some methods in order to find out the filename as well as the image itself. Once we have the (original) image, we can apply further transformations. In this case we want to crop the image. This method just splits the URL into several parts. The last part must contain the filename of the image. Therefore we can apply the usual Path.GetFileNameWithoutExtension() method. The next method which could be interesting is the GetImageFromUrl() method. This one will request a webpage from any web server by a given URL and return the image. We first look if the passed URL is a real absolute URL. If this is the case, we can start our request. This request will stream the response data into the memory stream. This is needed in order to get a seekable stream. Afterwards we create an image from this memory stream. The image is finally returned. The last method which can be detected in the code of our action is the CreateImage() method. This method will basically do the cropping. The code is straightforward for anyone who is familiar with GDI+. In order to conclude the server-side of our code, we need to attach the corresponding views. In our case, we just have one view to attach: UploadImage.cshtml (yes, we are going to use Razor as the view engine for this article). In order to maximize our efficiency, the first draft will be scaffolded by using UploadImageModel as model and Create as the scaffolding option. The resulting HTML is far away from our final goal. Why should we still use the scaffolding option? Well, first of all it is a good testing point. Of course unit testing our controllers is a much better test, but sometimes all you need is a one time "does it already work?!" test. If this is the case then we just did provide a testing environment within a second. The second reason to use the scaffolding option is that we have already a good basis. From this point on, everything we have to do is deleting, moving, and maybe adding something. The rest of the article can be found on the CodeProject. Created 5/14/2012 12:23:25 PM . Last updated 5/14/2012 3:52:52 PM . Generated in 45 ms. You are viewing the English version.